Until recently, when I needed a break I’d grab my phone. Until recently, when I needed a break I’d grab my phone. Whether I was bored, mentally fatigued, or just wanting a pick-me-up, I felt relief checking the news, Facebook, or Instagram. However, new research suggests there are good ways and not-so-good ways to spend our break time. While some breaks can leave us refreshed and reenergized, others tend to leave us depleted and drained. In their book “The Distracted Mind: Ancient Brains in a High-Tech World” Dr. Gazzaley, a neuroscientist, and Dr. Rosen, a psychologist, explain that good breaks can reduce mental fatigue, boost brain function, and keep us on-task for longer periods. But Gazzaley and Rosen forewarn that taking the wrong sort of breaks might make us more susceptible to boredom and may actually backfire by making us want to take breaks more often. In other words, repeatedly checking our phones when we get a tad bored can train us to check more often throughout the day. So by reaching for our phones when we want a break, we may be training ourselves to do it again and again. In order to resist the onset of boredom and self-interruption at work, Gazzaley and Rosen suggest we avoid our smartphones and instead take breaks that restore the part of the brain we use to keep focused on our goals. Located right behind the forehead, the prefrontal cortex is considered the most evolved portion of the human brain. Although it has many functions, goal management is its main business. The prefrontal cortex orchestrates attention, working memory, and other cognitive resources in order to help us get what we want. For example, if my goal is to cook dinner tonight, my prefrontal cortex will help coordinate my brain functions to guide me through the actions needed to complete the meal like navigating the grocery store, following a recipe, and cooking the meal, all while making sure I don’t get sidetracked. When we work, our prefrontal cortex makes every effort to help us execute our goals. But for a challenging task that requires our sustained attention, research shows briefly taking our minds off the goal can renew and strengthen motivation later on. Doing activities that don’t rely heavily on prefrontal cortex function but rely on different brain regions instead, is the best way to renew focus throughout the work day. Research shows that nature exposure is restorative for the mind. One study reported better working memory scores after a walk in a natural environment, but not in an urban environment. Work in a city? You don’t have to go far to benefit from nature. Just noticing the sights and sounds of natural features around you can help you recharge. If you are stuck indoors, look at some pictures of nature instead, as research shows they work too. Or try tuning into nature videos on your computer for a few minutes; like a tropical beach or a mountain creek. Having a moment with ‘nothing to do’ is rare these days. We dodge even the briefest moments of potential boredom with just a few swipes. However according to Gazzaley and Rosen, avoiding occasional periods of ‘nothing to do’ downtime may have some unintended effects. When we let our minds wander without focusing on a certain goal, the brain’s default mode network takes over. Daydreaming and doodling tap into default mode network activity and may give some prefrontal cortex functions a rest. Sit alone, set an alarm for 10 minutes, take a deep breath and be patient. If you need a little help, try the website Do Nothing for 2 Minutes for a quick session. You can also practice mind wandering in your daily life by keeping your phone in your pocket and letting your mind drift while you wait at a crosswalk, a train station, or in an elevator lobby. Our eyes bear the burden of our tech-charged lives. Fortunately, doing 20–20–20 eye breaks is a straightforward way to alleviate eye strain and fatigue. Every 20 minutes, stare at something 20 feet away, for 20 seconds. Gazzaley and Rosen explain the reason why this is beneficial is that it “…requires blood flow to brain areas that are not related to sustained attention.” The shift in blood flow across certain brain regions may be the reason why eye exercises are restorative. Laughter packs a punch. It increases heart rate, respiration, and it gets our blood pumping as our upper body muscles are recruited into the action. Although evidence of long term benefits of laughter is debated, short term effects show some improvements on memory tests. Spontaneous crack-ups, and forced giggles from laughter yoga or cheesy jokes by google assistant, all have the same perks. Listen to a comedy podcast or a stream a comedy radio station. Read the comics section in the newspaper in the breakroom. Or keep a funny book at the office to help you get through the next afternoon slump. We all know regular exercise benefits the body and the brain. The good news is that even short bursts of exercise are helpful for cognition. Just 10 minutes of physical activity can boost attention and memory performance. Find a secluded space to do a 7-minute workout, do some pushups or planks, or just take a brisk walk around the block. A little physical activity is a great way to rev-up your brain without breaking a sweat in your work clothes. The bottom line is breaks should make you feel better by providing a renewed sense of focus and concentration. As digital detoxes and tech-free zones rise in popularity, we are beginning to value the benefits of removing technology every now and then. Taking better breaks can encourage creativity and increase focus by relieving the prefrontal cortex of some goal management duties for a while. The next time you need to take a break at work, ignore your smartphone and skip the newsfeeds. Choose an activity that is restorative so you feel refreshed and more prepared to tackle the rest of your day. Taking good breaks is important for your daily productivity. 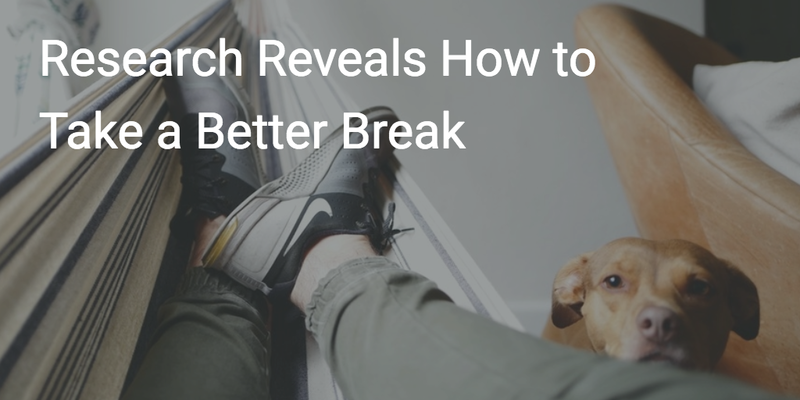 Breaks reduce fatigue, alleviate boredom, and can restore attention. Using tech during our breaks may backfire and make us more susceptible to boredom and want more breaks, more often. Restorative breaks can improve attention and refresh our focus. Originally published at www.nirandfar.com on March 30, 2017.